I am a member of a Meetup group that gathers monthly at Circles Of Wisdom in Andover, MA. 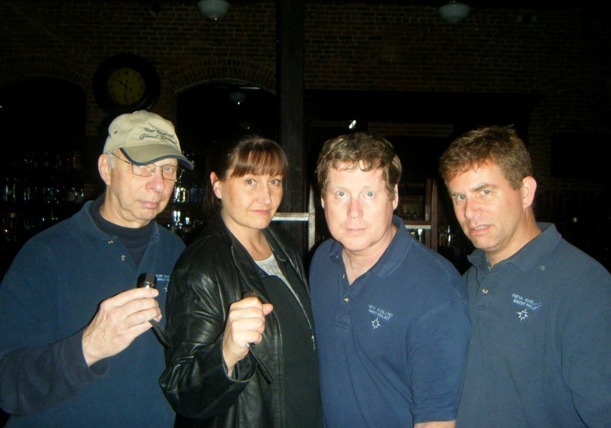 It is a paranormal study group led by my friend and the fearless leader of the New England Ghost Project, Ronald Kolek. 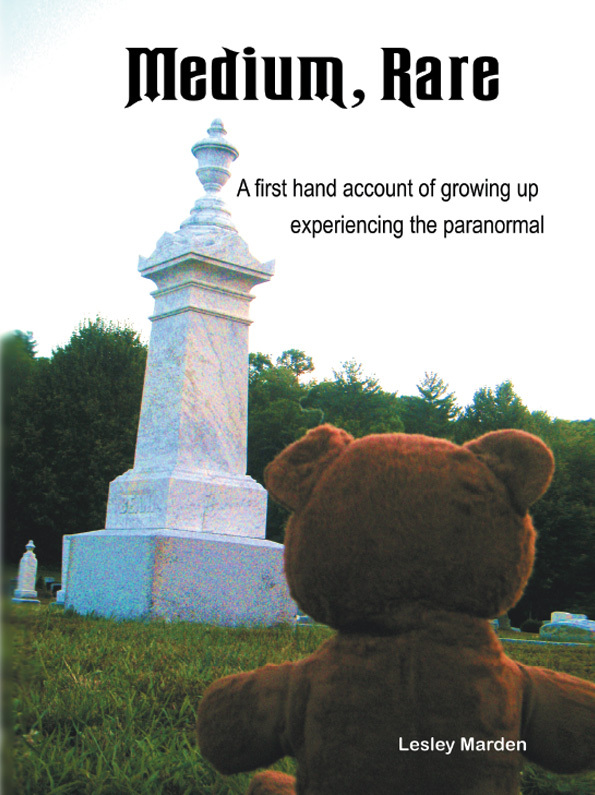 On the 3rd Tuesday of every month we look into all sorts of things within the realm of the paranormal. At December’s meeting we conducted psychometry experiments, dowsing experiments, remote viewing experiments and even tested the validity of a “psychic party game”. We then took out one of the tools in my bag, The Psychic Circle. The Psychic Circle is an oracle board, similar to a Ouija board. The difference is, with the Psychic Circle you open and close every session with a prayer of protection, and there are several modes of communication printed on the board. 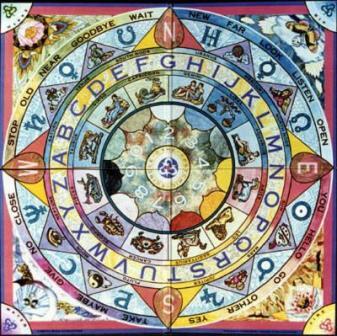 There are zodiac symbols, colors, words, picture symbols, elements, compass symbols as well as numbers and letters. The common complaint about oracle boards, is that someone could be manipulating the answers that are presented. I was on the board with three other people whom I completely trust. None of us would manipulate the board. What would be the reason to manipulate the board in the first place? We are trying to communicate with spirit. What would anyone have to gain by spelling out answers? I decided to secretly test a person’s ability to manipulate the planchette. I was not trying to be malicious, I just wanted to know if it could be done. I was suprised by the results. I attempted 2 times to willfully stop the circular disk. I could not stop it on any desired part of the board. It took an extreme amount of pressure to affect the speed of the planchette, and it would eventually stop, but no where near where I wanted it to stop. I attempeted to “steer” the disk toward a particular word on the board. I could not. I am a completely honest person. All I have is the truth. Honesty and personal integrity are the two most important qualities a person can posess. I hold and protect these personal traits above all others. I feel a little dirty with this experiment, but I could not let anyone know my intentions, otherwise they may have “allowed me to manipulate” the outcomes. I am happy to report, that the experiment was a complete success. My findings are that the board could NOT be manipulated at will. I have always trusted The Psychic Circle and will continue to use it as a valued tool. Now my trust has been confirmed and my confidence in the board strengthened. Now, for believing everything that the spirit world tells me….. That is a whole new kettle of fish. 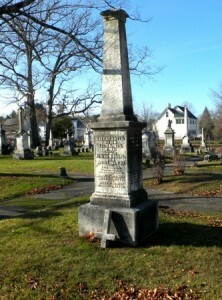 Recently my friends Fiona Broome and Sean Paradis and I travelled to the Old North Cemetery in Concord, NH. 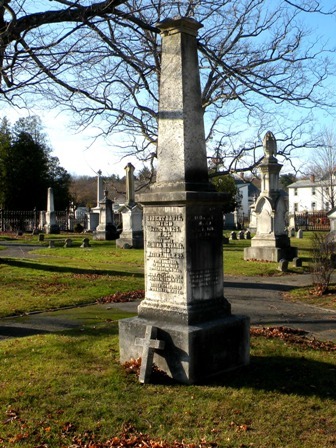 We were very interested in the cemetery within a cemetery, where the 14th President of the United States, Franklin Pierce is buried. As we walked around the fenced in area, we noticed some strange instances that didn’t add up. One of these was that some graves were turned at an angle, every one of the stones that were moved were all facing the exact same way. We thought that was odd. As we continued to search the cemetery for things that looked out of place, I noticed a monument with it’s top knocked off. The cross that was once perched beautifully atop the tall grave marker was now leaning against the monument in an inverted position. I said to Fiona and Sean “Oh, I have to fix that” and proceeded to go over to the monument and uprighted the cross. As I made my way back to where I was standing just a moment before, I noticed something had been placed in my path. 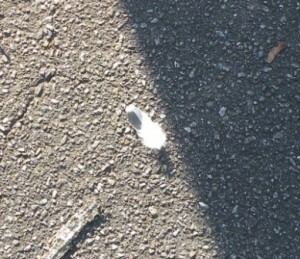 I looked down and to my amazement, there was a feather. It was not there as I made my way over to fix the Christian symbol, and there was no other feather to be seen within the whole entire graveyard. Sean was amazed, as was I. I believe that someone was showing their appreciation for my good deed. On a dark Monday evening, Ron Kolek, Clay Rucker, Jim Stonier and I packed up our equipment and journeyed to The Village Smokehouse in Lowell, MA. We were welcomed by staff members of the Howl In Lowell, an online magazine that covers everything happening in the area. We also were greeted by Rosemary Kellerher, who’s husband, Tim, owns the 4 story structure and worked countless hours by himself reconstructing the building. One day, Tim was convinced there was someone in the building with him as he was working alone. He picked up a 2x4 and searched the building, looking for the unwanted trespasser. There was no one. Kitchen workers hear voices, feel people pass by when there is no one to be seen, and have things move to places they shouldn’t be. Bartenders get creeped out when they have to go down into the basement area where the spare liquor is stored. One bartender/bouncer told me the always thinks he is going to see a little boy looking back at him, and he expects him to be wearing a newsboy cap and garb. When I was ready to enter the building, I knew none of this. I was not even told where we were going. As we walked into the front door of the building, I felt as if it was used for some kind of trade, BIG money trade where lawyers would need to be involved. Rich men with fancy suits and pocket watches from the late 1800’s. We entered the bar on the right and I had a feeling of energy in the pit of my stomach and a painful sensation in my jaw. I was made aware of a male who was not a residual haunt, but rather an intelligent spirit who walks the building and makes himself known to others through making noises, physically touching things, but nothing to do with the initial image of rich men. This was an average working Joe, from a later time period. We entered the men’s room, not much going on in there. Then we went into the ladies room. I felt sick in the stall that was closest to the back of the room, like something terrible had happened, a death. I felt like it was a rift between two men with an unfortunate outcome. Ron asked what the space was used for before it was the bathroom. Rosemary replied that the area in which we were standing was once a bar, and there was a man who confronted his wife’s lover in the bar and killed him. On the floors above I was sensing that there was physical movement, that things were touched and moved by unseen hands. I asked if people could hear heavy things being dragged across the floors and unexplained noises. The answer was yes. I believe this to be the work of the same male I was picking up on when I entered the first floor. We headed downstairs to the basement. The energy level and atmosphere in the basement was thick. 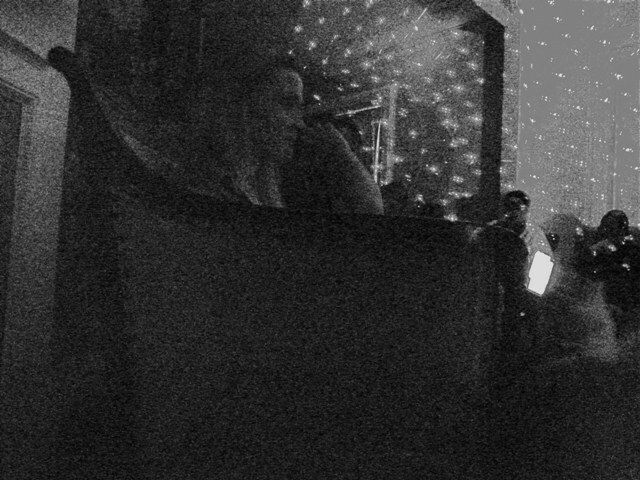 Each member of the Ghost Project felt the difference that the basement presented. As Rosemary brought me into a walk in cooler where the kegs are kept, I asked her if anyone had been touched in there. I felt that things would be actually be in physical contact with spirit. Rosemary told me that no on had been touched, but the knobs that keep the beer flowing from the kegs to the bar would be completely turned off, for no reason. Only Tim and the beer salesman are allowed to touch them. I also got the impression that there was a passageway from across the street that led into the basement, where “less than legal” happenings took place. Rosemary brought us to a tunnel that has been closed up. 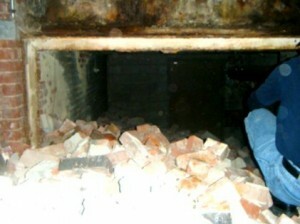 During an EVP session in this tunnel entrance way Jim caught what sounds like a man laughing at him. As we made our way through the basement to the office area, Rosemary was perplexed. A door to an internal office, which is ALWAYS locked because of it’s contents, was wide open and unlocked. She made a phone call to the person who works in there to ask if the door had been closed and locked when they left. The answer was “Of course it was”. We climbed the stairs to the 2nd floor and eventually came upon an elevator. I felt there was an accident associated with the elevator. Somehow I think there was a male who fell, and there may have been a woman involved, leaving behind an imprint of sorrow. On the third floor, Ron felt like he wanted to dance, like he should be bouncing up and down. We learned that it had once been a Jazz club. (Go Ron!) In another area of the third floor I was picking up a tightness in my neck, usually associated with a hanging. The energy on that floor seemed to be swirling around us, and again it felt male. On the fourth floor, I felt like there should have been a stage, or a performance going on. There was dust and a dead bird’s carcass on the floor. Ron asked me what I was picking up. I had an image of one of the rich men. He was wearing a light brown/tan suit, but the jacket had been taken off. He had a pocket watch in a pocket of his vest. I had him first appear in my head as we climbed the last stairs onto the 4th floor. As I walked across the floor, I felt as if the “cable went out”. You know, that feeling when you are losing consciousness, and then chest pain. I am not sure if this man died in the building from this heart attack, but it definitely happened in that room. We decided to do some dowsing to try to make contact. I pulled out my pendulum, and as soon as I did, I felt a male energy come close. It was the same male from downstairs, in the bar fight. He answered our questions, although, some of the answers did not seem to fit. I think that he answered honestly, but we may have asked the questions too quickly or maybe some queries were worded in an ambiguous way. After searching all of the floors we again were on the first floor. While Ron and I sat for Ron’s interview, Clay, Jim and Rosemary went outside. 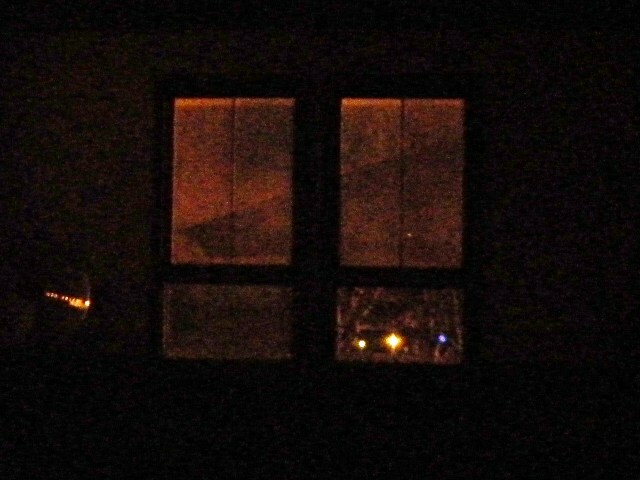 As they were looking up at the building they noticed lights upstairs. They all went upstairs to investigate. Clay told me that there were firefly like lights and audible noises. Rosemary was quite shaken, because whoever they had encountered up there left scratches on her face. You can see her state of uneasiness as she then sat down for her interview in the video below. You can also read the article which can be seen here that was posted by the lovely reporters from Howl In Lowell. It’s official! 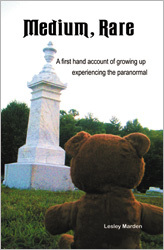 My book, Medium Rare: A first hand account of growing up experiencing the paranormal is now on Kindle! The huge task of formatting and editing has been on my To-Do list for quite some time. I had planned on doing it this summer while I was on vacation from my full time job. Unfortunately, sometimes things do not work out the way we envision. I had some personal matters this spring that carried over into the summer months and kept me from concentrating on anything but what I already had heaped upon my plate. Enter, my savior, my friend, Fiona! Without prompting, my friend took on this colossal task for me, out of the goodness of her heart, just to help me out. She skillfully edited, formatted and tweaked my book, then guided me through the steps to get my book on to Amazon as a Kindle version. She told me that this was a “Pay it Forward” kind of thing, where she takes time out every weekend to do something nice for someone else. This was WAY more than just something nice. This is leaps and bounds, above and beyond kindness and I am overwhelmed by her generosity! This kind act, without any expectation to receive something in return but my happiness and success, has filled my heart and the deepest recesses of my soul. So it is from the very bottom of my heart that I say “THANK YOU!” to my friend, Fiona. There are no words that would give my depth of gratitude or gratefulness justice. I have always made a conscious effort to be kind and treat others the way I would want to be treated, but after this experience I believe I can give a little more. I believe we all can. What a lesson. What a blessing. What great friend. On a recent public investigation with the New England Ghost Project at the Houghton Mansion in North Adams, MA a curious thing happened. This serves as a reminder that you may stumble upon something you may have never imagined finding. There was a large group of people gathered in Mary’s room on the second floor. Guests of the ghost hunt were sitting in couches along the walls of the room and in chairs that were brought in to accommodate the amount of people who were not comfortable sitting on the floor. There were guests sitting in a circle on the floor attempting to connect with spirit, and there were multiple pieces of equipment set up and being held by some of the guests. As we all sat in the darkened room that was dimly lit by the green hue of a laser grid, the Ghost Radar was spitting our random words. Ron Kolek, founder and lead investigator of the NEGP noticed something dart across the room. From the time we first sat down in the room, I was taking random photographs with my digital camera. Meanwhile, the Ghost Radar generated two very interesting words that seemed to coincide with what we were experiencing. They were “cat” and “killed”. When I returned home the next day, I uploaded my photos to my computer. The photos from the session in Mary’s room were dark. Because it was dark I raised the brightness. Look in the bottom left hand corner of the photo. Now, although this is not scientific proof, it is very compelling evidence. We have not one, but two eyewitness accounts in separate areas of the mansion, without knowledge of the other group witnessing the same phenomena, ruling out a hysterical account, a piece of equipment stating “cat” and “killed”, and this interesting photo of what appears to be the form of a cat. Here is the photo file where I have changed the contrast level in the photo. Author Lesley MardenPosted on August 20, 2012 February 26, 2016 Categories Investigations, UnusualTags MA, NE Ghost Project2 Comments on Here Kitty, Kitty! I am back from Oneida, NY, where on Saturday, May 19th, I was lucky enough to experience the Collinwood Inn with Ron Kolek and Karin Ruck of the New England Ghost Project, and Anne Kerrigan of East Bridgewater’s Most Haunted. 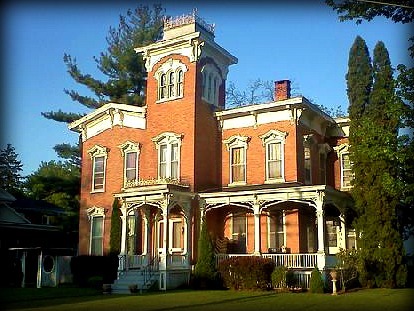 Also known as the Farnam Mansion, The Collinwood is an gorgeous B&B with a Dark Shadows theme. Our hosts, owners Brian and Gerri Gray were warm, friendly and welcoming. We were all in awe of the beautiful antiques and the meticulous details of the ceiling medallions and trimmings that Brian had worked so hard restoring to make this mansion truly shine. When we arrived the spirit energy of the house made an impression as I walked across the threshold. High levels of energy encountered on the first floor were in the dining room, the parlor and in the master bedroom. I had images of doctors bags and stethoscopes as I entered the hallway. Brian said that 3 doctors had each owned the building at one time. The dining room introduced me to female energy and a picture of my mother in law in my head. I asked Brian if there was a Shirley or a May associated with the house, as this was my mother in law’s name. He confirmed that there was indeed a Shirley associated with the house and that she had a “bowl of boobies” as she called them, in a bowl placed at the very window where I was standing. Anne was in the Quentin room. Red walls and a red fainting couch, perfect for “The Blonde Bombshell” to stay in. I didn’t pick up much energy as we took photos of Anne stretched out as if she had fainted on the tufted antique. Our facebook friend and “Ghost Chronicles-The Next Generation” chat room aquaintance, Cat and her husband Raf came all the way from Canada to be with us for our ghost hunt. The were in the Barnabas room. I think that the lung issue I was feeling originated from this room, as it is at the top of the stairs. Karin and I were in the Josette bedroom directly across the hall from Ron. As we entered our bedroom I felt no energy what-so-ever. A good night’s sleep was assured for us! The rest of the guests arrived and the house turned dark with the setting of the sun. To kick off the investigation, we started in the basement. 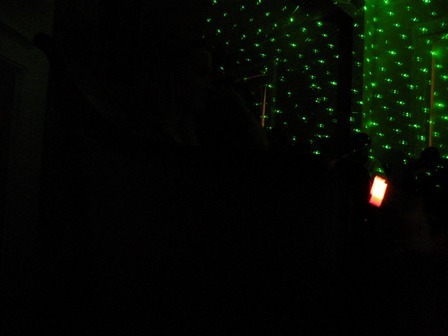 There were high levels of EMF in the large room of the basement where we started our investigation. There was a male energy present. Ron took out the Shack Hack, which is a radio which has been altered so that constantly scans the radio stations at a rapid pace and is unable to stop on any. This is supposed to enable a spirit to pull any of the millions of words being spoken on the airwaves, and use them to communicate through the device. The name Georgie was broadcast from the radio and as Ron asked questions, people’s EMF meters would respond. Some of the beeps seemed to directly coincide with questions asked, and some we found to be associated with the electircal wires that ran across the ceiling. We moved to the other side of the basement to a long sort of corridor. I felt a female energy at the end in the corner. As I connected I could see that she was an older woman, with gray hair and some sort of cotton, snap down the front housecoat. Ron obviously was not completely on board with what I was saying and wanted to leave the area. He changed his mind about going upstairs when he saw a candelabra. He decided to try to an experiment to make contact with spirit. Karin had some divining rods and Ron lit the candles in the candelabra. He was asking questions and through yes and no questions it was confirmed that there was indeed an older female spirit present. I knew that the female wasn’t a wife of a former owner the house, so using my logical brain, I thought maybe she could be attached to one of the antiques being stored in the basement. I asked Ron to ask if she was attached to the chair or the trunk, and he showed his annoyance by raising his voice with his answer of “No she’s not!” and suggesting to the guests that I didn’t know what I was talking about, when I was just trying to make sense of the energy by asking questions. During this divining rod session of communication, this photo was captured by Gerri, clearly showing and ectoplasmic mist forming at Karin’s left shoulder. Hmmmmm, was I just babbling nonsense? WHATEVER! Ron is lucky I am such a nice person. I let it go. We moved to the first floor and we split up. Ron took a group into the parlor and was playing the organ, while Karin and I took a group into the master bedroom. These rooms are connected by a locked door. I had an image of butterflies pinned behind glass in a display case and was getting masculine energy from the room itself. I also felt as if the room had been used for viewings after a death. Gerri confirmed that it was once a gentlemen’s smoking room, and after the investigation, Karin informed me that she discovered that one of the doctors that lived there was a botanist and kept collections of plant samples, which would go hand in hand with natural displays. Karin decided to play a little trick on Ron and asked the spirits to play along. She asked the spirits to leave Ron’s group and come into our space. As soon as she asked, we heard Ron say “What was that?” through the wall and at that very moment all of the activity that Ron’s group was picking up on abruptly stopped. We asked for a sign of the spirit’s presence, and it was again the woman from the basement. When we asked the room went darker than it already was. I realized that the streetlight had gone out. Karin asked our spirit that if she had anything to do with the streetlight, to give us antoher sign. The streetlight turned back on. She then asked if our spirit could do it again, and the streetlight next to the original one went out. Coincedence?? As the evening went on the activity seemed to wane. At the end of the evening, after Gerri and Brian’s séance, we moved to the parlor once more to communicate with spirit by using a glass upon a table. As we were conversing with a new female spirit, I felt a strong male presence entering. All of a sudden all of the EMF meters that had been left on, in the middle of the séance table, in the room directly across the hallway from us, began to go off at full blast. Anne took her video camera over to document it. They continued to bellow for more than a couple minutes, and when we broke the communication off at the table with the female and closing the circle, without acknowledging the male spirit energy, the EMF meters fell silent. We thanked our guests, and said goodnight to them all and we sat in the parlor and talked about the night. As we sat there we all heard a loud male voice in the next room (the master bedroom). Every person in the house was in the parlor and we all heard it. Brian said “Welcome to the Collinwood!”. **Note** It has come to my attention that the spirit woman in the basement WAS a wife of a former owner. This is why it is so important to know nothing on an investigation. Brian had mentioned unintentionally that Farnam died, leaving his wife Sarah. My logical brain dismissed that the spirit in the basement would be Farnam’s wife, because he was married to Sarah. Elizabeth was Farnam’s first wife who died in the mansion. This is how Ron knew I was going down the wrong path. This is knowlege that Ron must have had prior to investigating. Now that the pieces are fitting together, it makes total sense why he would try to stop me . I believe it was a woman who lived in the house alone for a while. I believe the spirit of the older woman in the basement who I saw to be Shirley. Her snap down the front housecoat reminded me of one my own grandmother would wear, so the time period for the spirit woman would be late 1970’s early 80’s. He let it go. It is a good thing he is such a nice person. I love dowsing, there is no denying that. So, when my friend and fellow paranormal investigator, Sean Paradis most generously gave me and friend Fiona Broome each a bag of his hand made pendulums to try out, I was overwhelmed. Each gift bag contained a sample of beautifully unique and well balanced pendulums that are available for purchase at Sean’s website Sleeping Meadows. If you are looking for a piece that is something other than the traditional teardrop design, this is where you will find what you are looking for. 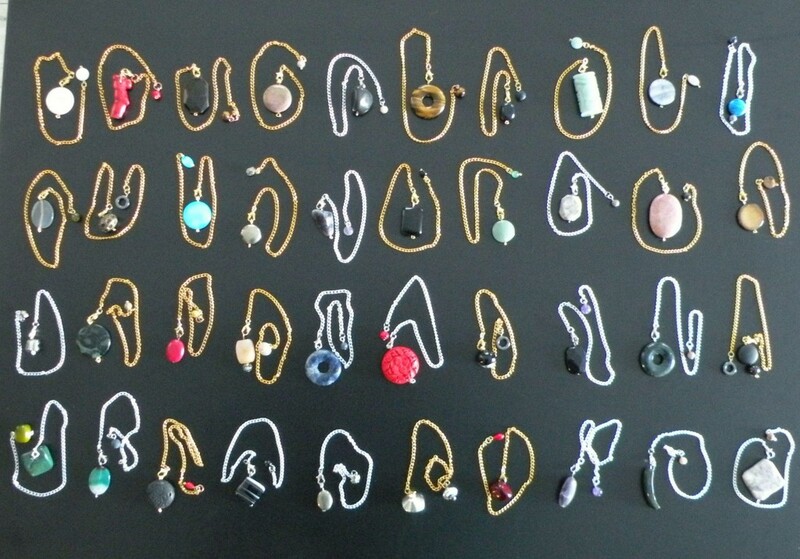 Pyrite, lava rock, coral, jasper, amethyst, jade, shell, agate, onyx…the list goes on and on. Thank you, Sean for your kindness, your generosity and your friendship! Update: Thanks to everyone who made this a great event! Join The New England Ghost Project and special guest Psychic Medium Jane Doherty of the USA, and Parapsychologist Cal Cooper and Psychic Artist Brian Sheppard from the UK as two countries from either side of the Atlantic come together for a weekend of everything paranormal. Many other special guests and presenters will be on hand for workshops, presentations, psychic readings, ghost hunts, all in one place. Be there this July for a weekend of Science vs. Spirtuality. Do you dare test which side you are on? Click HERE for information and tickets! Take Part In An Intercontinental Experiment! 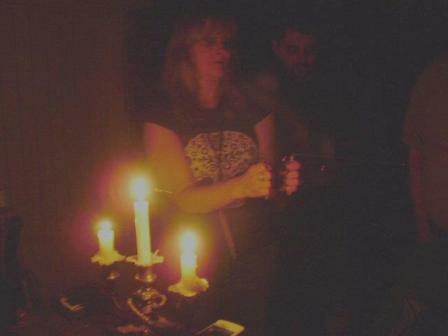 Would you like to take part in a real paranormal experiment? Cal Cooper, Parapsychologist from England, and Ronald Kolek of the USA are conducting a double blind experiment on dowsing. If you would like to participate please follow the directions in the video below and post your results in the comment section of this article. You say you don’t have a pendulum? No Problem! You can use a necklace with a charm, or some thread and a needle, or some string and a big button. This is your chance to help out, so give it a whirl! Although the playoffs and Super Bowl are over, it doesn’t matter. There is still time to participate! Author Lesley MardenPosted on February 13, 2012 February 26, 2016 Categories EventsLeave a comment on Take Part In An Intercontinental Experiment! It was an interesting evening of exploring at the Veasey Estate in Groveland, MA. The New England Ghost Project checked out the different areas of the building while reporters from the Boston Globe tagged along. Click here to read their article. I would like to extend a hearty “Thank You!” to our fearless leader Ron Kolek, Jim Stonier, Karin Ruck, Susan Yeates and our guest investigator Allison Gouveia for another interesting and enjoyable investigation! Here is an interesting photo from that evening. Notice the upper right hand window from the church on the property. What do you see?